This past weekend, we traveled to Cajamarca, located in the northern part of Peru. We left by bus at 10:30pm Friday night and arrived at around 4:30am Saturday morning. Cajamarca is nearly 9,000 feet above sea level, so it was nice to actually have an excuse to be out of breath for once. Upon arriving to Cajamarca, we drove directly to the Plaza de Armas—the city center, and arranged for an organized tour later on in the day. As we walked around, we were able to watch the sunrise, and grab a quick breakfast in the local market. After stopping at Cumbemayo, we had some time off for lunch before resuming our tour at Ventanillas de Otuzco. This burial site is home to remains of more than one thousand years—all in the shape of windows, or ventanillas. We left Cajamarca Sunday night at 10:30pm, and arrived back in Trujillo on Monday morning at 4:30am. While we didn’t get to spend much time in Cajamarca, it’s truly a beautiful city with an incredibly vast history. This morning, some of the other students and I traveled to Chan Chan, where we were able to see ancient ruins dating back hundreds of years ago. Chan Chan in Chimor translates to “Sol Sol” in Spanish or “Sun Sun” in English. As you can see in the pictures below, the attention to detail is truly magnificent. In this day and age, it’s difficult to find a contractor who will provide such noteworthy work and get the job done before the mortgage is paid off. 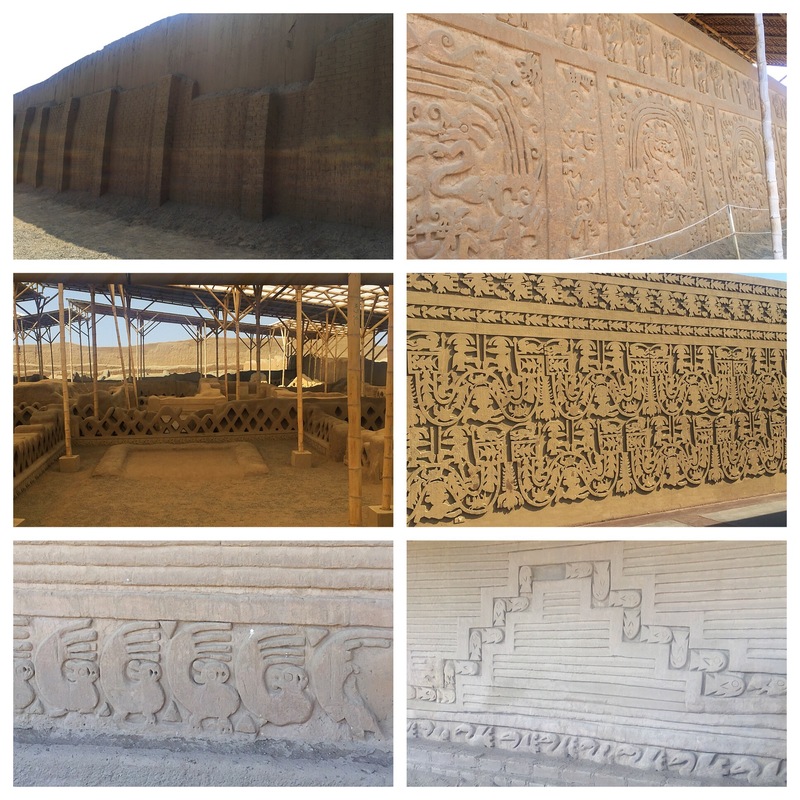 But what the Chimu civilization was able to do was, and continues to be truly impressive. This next part comes from Cartwright (2016) because I wouldn’t be able to accurately describe the historial importance of these ruins on my own. Hathaway (2009) states, “During its heyday, about 600 years ago, Chan Chan, in northern Peru, was the largest city in the Americas and the largest adobe city on earth. Ten thousand structures, some with walls 30 feet high, were woven amid a maze of passageways and streets. Palaces and temples were decorated with elaborate friezes, some of which were hundreds of feet long. Chan Chan was fabulously wealthy, although it perennially lacked one precious resource: water. Today, however, Chan Chan is threatened by too much water, as torrential rains gradually wash away the nine-square-mile ancient city. Located near the Pacific coast city of Trujillo, Chan Chan was the capital of the Chimú civilization, which lasted from A.D. 850 to around 1470. The adobe metropolis was the seat of power for an empire that stretched 600 miles from just south of Ecuador down to central Peru. By the 15th century, as many as 60,000 people lived in Chan Chan—mostly workers who served an all-powerful monarch, and privileged classes of highly skilled craftsmen and priests. The city was established in one of the world’s bleakest coastal deserts, where the average annual rainfall was less than a tenth of an inch. Still, Chan Chan’s fields and gardens flourished, thanks to a sophisticated network of irrigation canals and wells. The Chimú civilization was the ‘first true engineering society in the New World,’ says hydraulic engineer Charles Ortloff, who is based in the anthropology department of the University of Chicago. He points out that Chimú engineering methods were unknown in Europe and North America until the late 19th century. Although the Chimú had no written language for recording measurements or drafting detailed blueprints, they were somehow able to carefully survey and build their massive canal through difficult foothill terrain between two valleys. Ortloff believes the canal builders must have been thwarted by the shifting earth. Around 1300, they apparently gave up on the project altogether.